Even with new products and federally guaranteed loans, Chrysler was in rough shape in 1981. The costs of launching the K-cars and Imperial had further eaten away at the corporation’s scant available cash. Its new cars were off to a slow start on the showroom floor, requiring generous rebates to spur sales. The economy was still in poor shape and the public was understandably nervous about Chrysler’s prospects. Worse, the new cars suffered poor assembly quality (a seemingly eternal Chrysler problem), leading Iacocca to revive the old five-year/50,000-mile warranty, which Lynn Townsend had quietly axed back in 1971. The warranty and the rebates helped, but they were expensive. To receive the third and last of Chrysler’s federally backed loans, amounting to some $300 million, Iacocca had to obtain a further $600 million in concessions from suppliers and the UAW. In addition, with the help of the Treasury Department, the banks were persuaded to forgive a substantial portion of Chrysler’s remaining debt — more than $1.1 billion — in exchange for company stock. Despite such assistance, Iacocca’s relationship with his government overseers — the Loan Guarantee Board, which consisted of the chairman of the Federal Reserve, the comptroller general, and the secretaries of Labor, Treasury, and Transportation — was uneasy. Treasury Secretary G. William Miller openly admitted that he wanted to make the situation difficult for Iacocca in order to give the Chrysler chairman added incentive to pay off the loans. Iacocca was ordered to report monthly to the guarantee board, a duty he detested, particularly since the board had the authority to remove him if they felt he wasn’t holding up his end of the deal. Iacocca was further annoyed when Treasury decided to raise the government’s guarantee rate from 0.5% (the statutory minimum) to 1.0%. Moreover, the loans remained a public relations nightmare, routinely provoking negative headlines and derisive editorial cartoons that did nothing for Chrysler sales. To face Chrysler’s public relations problems, Iacocca took an unusual step: becoming a pitchman for his own company. It was not Iacocca’s idea; it was suggested by Chrysler’s new ad agency, Kenyon & Eckhardt, in 1980. The ad men told Iacocca that the best person to convince America that Chrysler was not about to collapse was him. Iacocca was reluctant, but they eventually talked him into it, leading to a series of memorable TV spots. Rather than try to dance around Chrysler’s problems, K&E opted to face them directly with a tough-talking, no-nonsense approach for which Iacocca became famous. Behind the scenes, Iacocca was in the awkward position of negotiating with his old boss, Henry Ford II. Although Ford Motor Company was still far healthier than Chrysler was, Ford’s 1980 losses were nearly as bad as Chrysler’s were — around $1.5 billion. With the help of Salomon Brothers and Goldman Sachs, Ford’s investment bank, Chrysler put together a proposal for a Ford-Chrysler merger. The prospect of Iacocca and Henry Ford II coexisting in such an environment was a stretch, but Iacocca suggested that both he and Ford step aside after one year, leaving the management of the joint company to others. How seriously Iacocca meant that offer is unclear, but it was a moot point because Ford rejected the proposal almost out of hand, something Iacocca attributed to sour grapes on the part of his old nemesis, Phil Caldwell. As we mentioned in our previous installment, Chrysler’s 1982 sales were even worse than those of 1981, dropping under one million units. Cost reductions, however, had lowered the corporation’s break-even level from 2.3 million units (a figure it hadn’t even approached since 1973) to only 1.1 million. Although Chrysler had fallen short of that mark in ’82, it was a far more attainable figure. By 1983, the national economy was improving, and sales rose to 1.3 million, enough to earn Chrysler a genuine profit for the first time in several years. On the strength of that performance, in the spring of 1983 Chrysler issued 26 million new shares of stock, netting $432 million. The motivation for the stock sale was simple — Iacocca immediately wrote a check for $400 million to pay off one of the three federal loan draws. He and the Chrysler board subsequently decided that they should repay the balance before the end of the year. On August 15, 1983, Iacocca handed the loan trustee a check for the remaining $800 million, plus an additional $13,487,500 in interest. The loans had been repaid in full, seven years ahead of schedule. There remained a final wrinkle to be sorted out, however: the 14.4 million call warrants Chrysler had issued to the Treasury Department as a deal-sweetener back in 1980. (A call warrant is a transferable certificate that gives the bearer the right to purchase a share of stock at a pre-negotiated price — in this case, $13 a share — on or before a specific date, which in this case was 1990, the original due date of the federally guaranteed loans.) At the time the warrants were issued, Chrysler stock traded for only $5.50 a share, so the warrants had essentially no value. By the summer of 1983, the stock price was up to nearly $35 a share, which suddenly made the warrants a major potential liability for Chrysler; issuing an additional 14 million shares of stock would have diluted the value of its existing shares by an uncomfortable margin. In May 1983, Iacocca asked Treasury to simply give the warrants back. Even G. William Miller probably would have balked at that suggestion; Ronald Reagan’s Treasury Secretary, Don Regan, a former stockbroker, was not about to surrender a valuable asset for nothing. A series of increasingly contentious negotiations ensued, with Regan ultimately opting to hold a public auction. Infuriated, Iacocca attempted unsuccessfully to appeal to President Reagan, who promised to intervene, but never did. Finally, in late September, Chrysler was compelled to bid against its own offer, finally paying $311 million for the warrants. Iacocca was resentful of the whole affair, and his 1984 autobiography is tinged with bitterness toward the Reagan administration. An improving economy did wonders for Chrysler’s sales over the next few years, as did the introduction of the groundbreaking T-115 minivans, a concept Iacocca and Hal Sperlich had considered at Ford in the 1970s. The compact, front-wheel-drive vans, based on the K-car platform, got off to a slow start, but, unlike the K-car, their sales improved each succeeding year. They eventually accounted for a large percentage of Chrysler’s business. The minivans were essentially unique when first introduced (at least in the U.S.; the contemporary Renault Espace was conceptually similar). Chrysler benefited greatly from the fact that it took GM, Ford, Toyota, and Honda more than a decade to develop anything truly comparable. The minivans left Chrysler’s balance sheet in a far rosier state than it had ever been. The company posted a $2.4 billion profit for 1984 and a still-impressive $1.6 billion for 1985. Popular opinion gives Iacocca sole credit for saving Chrysler, an idea Iacocca himself promoted heavily in his autobiography and commercials. Many of the difficult decisions, though, were John Riccardo’s, although it was up to Iacocca to carry them out and to sell them to the company, Congress, and the public. Calling Iacocca the company’s savior is perhaps an exaggeration, but it was certainly the greatest selling job of his life. It was also a personally taxing one, particularly since his wife, Mary, was simultaneously struggling with complications of diabetes; she died on May 15, 1983, three months before Iacocca paid off the last of Chrysler’s loans. Iacocca was richly rewarded for his efforts. His base salary grew by 30% for 1983, another 20% for 1984, and a further 17% for 1985, plus generous bonuses and stock options. For the rest of the decade, he was the most highly compensated executive in the auto industry. His total compensation for 1983 was $5.4 million, which earned sharp criticism from the UAW — including Doug Fraser, who still had a seat on the Chrysler board. Their objections were understandable because the cost of Chrysler’s revival had been high. More than 70,000 jobs were permanently eliminated between 1978 and 1983, about half of the corporation’s pre-bailout payroll. Although Iacocca’s claims about how many jobs the bailout saved always included jobs at Chrysler’s suppliers and dealers, no one has ever estimated how many jobs were lost by Chrysler suppliers during the period when the company couldn’t pay its bills. 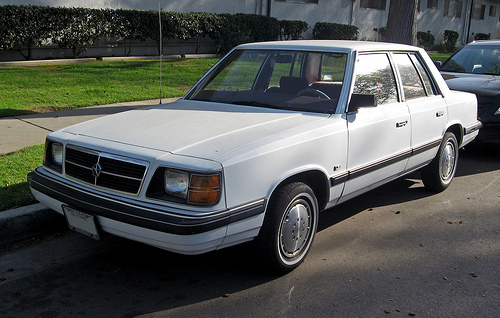 The Chrysler K-car survived for many years with minimal changes; this is a 1988 Dodge Aries America sedan, which sold for a modest $6,995. It accounted for a respectable 85,613 sales. Moreover, the company’s rank-and-file workers had paid a disproportionately heavy price. The loss of income for UAW workers, who had accepted pay cuts that left them more than $2 an hour behind their counterparts at GM and Ford, was much steeper than that faced by most Chrysler executives under Iacocca’s much-ballyhooed Salary Reduction Program. Furthermore, only two years after that program began, seniors executives had their salaries restored to their 1979 levels, including retroactive payments for their lost income during the previous two years; factory workers enjoyed no such recompense. One could argue that Chrysler’s management deserved a competitive salary — simply retaining an effective executive staff in a corporation in such critical condition is challenging — but it sent an uneasy message. Did the bailout save Chrysler from bankruptcy? Not exactly. There were lengthy periods between 1979 and 1981 when Chrysler was technically insolvent — had its various suppliers and creditors tried to force immediate payment of monies owed, the company would have been forced into receivership. What spared Chrysler from Chapter 11 were the many concessions made by suppliers, which ranged from a willingness to accept IOUs instead of cash to retroactive price cuts. The federal loans and Chrysler’s turnaround plan did probably encourage the company’s suppliers to cooperate, but their choices were limited in any case. The most lasting impact of the bailout came not from the federal loan money, but from the extremely generous concessions Chrysler received from its creditors. The banks forgave more than $700 million of Chrysler’s debts in exchange for preferred stock (traded early in 1983 for common stock), and allowed the company to pay off an additional $740 million of debt at 30 cents on the dollar. In essence, the bailout deal gave Chrysler a number of the advantages of bankruptcy without the stigma of actually declaring Chapter 11. Defenders of the bailout note that the federal government actually made money on the deal. By Iacocca’s reckoning, Chrysler paid out $404 million in interest, $33 million in administrative fees (the Loan Guarantee Board charged Chrysler a $1 million monthly fee for its services), $67 million in legal fees, and $311 million for the return of the call warrants. Still, there are any number of reasons why running Treasury as a for-profit entity is a bad idea. Furthermore, the Reagan administration was wholly resistant to suggestions made by Iacocca and several members of Congress to invest the interest in a fund to retrain or otherwise assist Chrysler’s laid-off workers, so the money did little to alleviate the pain caused by Chrysler’s corporate downsizing. Chrysler’s cost-reduction program also entailed deep cuts in capital expenditures and R&D, which seriously hurt Chrysler’s product development later in the decade. Iacocca might have avoided that problem if he had reinvested the company’s substantial mid-eighties profits in new products, but he opted instead for a series of high-profile acquisitions, most of them in non-automotive businesses. Over the next few years, Chrysler bought Gulfstream, Electrospace Systems, Airborne Systems, Thrifty, Snappy, Dollar Rent a Car, E.F. Hutton, and a variety of other financial services companies. At the time, diversification seemed like a prudent choice; after the auto industry’s roller-coaster ride of the previous decade, all the U.S. automakers were considering it. Still, all of these acquisitions drained capital that might otherwise have been used to improve Chrysler’s car and truck lines, and many proved to be expensive boondoggles. For example, when Chrysler attempted to sell its new aerospace divisions at the end of the decade, it was only able to find a buyer for Gulfstream; the sale netted $825 million, which on an inflation-adjusted basis wasn’t a whole lot more than Chrysler paid for it in 1985. On the automotive side, Chrysler acquired Lamborghini, a 24% stake in Mitsubishi, a small share of Maserati, and the failing American Motors Corporation, which included the Jeep brand. The decline in Chrysler’s R&D wasn’t immediately obvious, because the company continued to bring out new products, most of them derivatives of the K-car platform. Chrysler’s engineers became expert at spinning off new variations on existing architecture and engines; Chrysler led the industry in turbocharging, for example, in large part because the money for completely new engines was simply not there. The problem was that the resultant products, except for the minivans, became progressively less competitive as the decade went on. 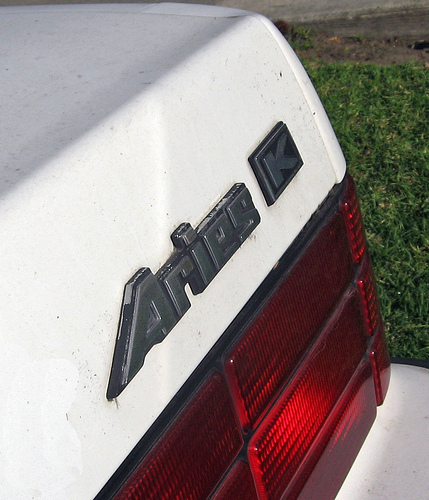 Even the “new” AA-body cars — the Dodge Spirit and Plymouth Acclaim, introduced for 1990 — were yet another rehash of the K-cars, whose engineering and rectilinear styling hadn’t been exactly cutting-edge even in 1981. The Honda Accord had been redesigned three times since then, the Toyota Camry twice, each a notable improvement on its predecessors. Meanwhile, Ford had finally introduced a truly modern front-wheel-drive platform, the Taurus, with cutting-edge, aerodynamic styling. Chrysler became more and more dependent on cut-rate pricing and heavy rebates to maintain its sales volume. Chrysler was still profitable through 1990, but its margins slipped each year and its 1990 profit was only $68 million, accompanied by a drop in market share from 13.8% to 12.3%. The company lost $795 million the following year, largely because of a sluggish economy and the impact of Iraq’s invasion of Kuwait. A decade after the federal bailout, the company was again flirting with bankruptcy. Had it not been for the arrival in 1987 of AMC’s François Castaing, who subsequently became VP for Vehicle Engineering, Chrysler might have continued churning out K-car clones well into the 1990s. Castaing and Chrysler president Bob Lutz, however, pushed hard for a radical reinvention of Chrysler’s product-development approach, with leaner, more cohesive “platform teams” for each new vehicle. The test case was the Dodge Viper, a sports car that Lutz had pushed into small-scale production in 1989. The Viper project was very successful from the standpoint of production efficiency, and Castaing and Lutz lobbied to institute the same process on a larger scale for Chrysler’s mainstream vehicles. Iacocca finally agreed, but only with great trepidation. By the end of the decade, Iacocca’s public image, once overwhelmingly positive, had been soured by years of anti-Japanese rhetoric, which many observers saw as making excuses for the failings of the domestic industry. Iacocca seemed to have grown more conservative over the years, less willing to accept change. He clashed repeatedly with Lutz, whose privileged background was a sharp contrast with Iacocca’s and he tried several times to fire Castaing, although Lutz always blocked him. Whatever his misgivings, Iacocca did eventually approve a seismic shift in Chrysler’s engineering strategy, which led directly to the superbly designed Neon, LH cars (Dodge Intrepid, Eagle Vision, and Chrysler Concorde), JA-cars (Dodge Stratus, Chrysler Cirrus, and Plymouth Breeze), and the Jeep Grand Cherokee. In both styling and engineering, they were the most convincing efforts a domestic manufacturer had fielded since the Ford Taurus in 1986. Their development was expensive — the LH cars alone cost $1.5 billion — but Chrysler was once again an industry leader. Iacocca stayed several years past normal retirement age, finally stepping aside in late 1992. His succession had been a contentious issue for the past several years and had seen the demise of a variety of likely successors. In the end, he chose an outsider, Robert J. Eaton, head of GM’s European operations. Eaton inherited a company far better positioned for the future than before (most notably, work had already begun on the successors to the LH cars), but his relationship with Lutz, Castaing, and design boss Tom Gale appears to have been a tense one. Former Chrysler engineer Bob Sheaves also blames Eaton for a last-minute cost-cutting program that contributed directly to problems like the head-gasket and exhaust failures that plagued the Neon and the LH cars’ inadequate air conditioning. Whatever short-term savings those measures provided were balanced by higher warranty costs and unhappy customers, undercutting the impact of some genuinely impressive new products. Questionable management decisions have been an endemic problem for the American auto industry since the 1950s. Chrysler, being one of the smallest automakers, has arguably suffered the worst simply because it has less margin for error, but its problems are not unique. They bespeak larger issues that beset the entire industry and to some extent the entire American economy. There but for fortune, as the saying goes, go we all. In May 2009, we licensed a condensed version of this story to Clearwire Corporation’s Clear 365 channel. However, Clearwire had no connection with the original article. Our sources for this article included the Auto Editors of Consumer Guide, Encyclopedia of American Cars: Over 65 Years of Automotive History (Lincolnwood, IL: Publications International, 1996); David Halberstam, The Reckoning (New York: William Morrow and Company, 1986); Lee Iacocca, Iacocca: An Autobiography (New York: Bantam Books, 1984); Charles K. Hyde, Riding the Roller Coaster: A History of the Chrysler Corporation (Great Lakes Books) (Chicago, IL: Wayne State University Press, 2003); Manuel Velasquez, “The Chrysler Loan,” from Chapter 3 of Business Ethics: Concepts and Cases Fifth Edition (Upper Saddle River, NJ: Prentice-Hall, Inc., 2006); James K. Hickel, “The Chrysler Bail-Out Bust,” The Heritage Foundation, 13 July 1983, www.heritage. org, accessed 25 November 2008; and Terry Parkhurst, “Lynn Townsend, Former Chrysler President,” Allpar, n.d., www.allpar. com, accessed 23 November 2008. Some information on the final days of Iacocca’s reign at Chrysler came from Bill Vlasic and Bradley A. Stertz, Taken for a Ride: How Daimler-Benz Drove Off With Chrysler (New York: William Morrow, 2000) and an online discussion at Allpar.com with former Chrysler engineer Robert W. Sheaves 21-28 April 2008, (www.allpar. com/ forums/index.php?showtopic=103289, accessed 31 July 2008). As someone who grew up in Silicon Valley in the Roaring 90s, it amazes me that big companies like Chrysler can be so dysfunctional for so long, yet still keep operating. I’m used to 1-2 bad years and it’s over. I’m curious to see Part 4. Dunno if it’s already written yet, but I’d love to see your take on rental fleet sales. It seems like an addiction of the big 3 that doesn’t help their case any. My take on the big 3 right now is that they’ve got way too much capacity. Too many plants and too many workers. Additionally, their addiction to volume hurts consumer choice. It forces them to abandon what could otherwise be good models (or model variations), but would only sell at lower volumes. Difficult to turn big ships around! Also Chrysler management (pre-Iacocca) were too proud to think that buyers would go for fuel saver imports, bad management. Well, yes and no. After acquiring the Rootes Group, Chrysler did import the Hillman Avenger (as the Plymouth Cricket) for a while and for a while also continued limited U.S. sales of the Simca 1118 and 1204, but dropped both in the early seventies, I assume because they weren’t selling enough to justify modifying them to meet the 5-mph bumper standards. There was also Chrysler’s relationship with Mitsubishi, which started around 1971, and of course by MY1978 there was the U.S. Horizon/Omni, which was in the works well before Iacocca arrived. It’s true that Chrysler didn’t have a U.S.-built small car to directly match the Ford Pinto/Chevrolet Vega, although there was admittedly a pretty good chance that such a car would have cut into sales of the A-bodies, which were rapidly becoming Chrysler’s bread and butter. Really, though, what Chrysler lacked when it came to small cars was not so much product as focus. They had a lot of scattershot efforts that could have been put together in a more cohesive way than they did. I’ve been following Chrysler’s failure unfold for the past few months now. I’m too young to remember their 1970s problems, but I do remember the K cars and how crude they seemed compared to imports. I also remember when the first minivans arrived, and how they turned the automotive world on its ear, similar to what the Taurus did. Even now, 25 years later, the other companies are still playing catch-up. Not surprising, since GM (IIRC) didn’t launch their own until after Chrysler had most of the bugs ironed out and established themselves. Anyway, well done article…and I’m looking forward to Part Four. Keep up the good work! The competition (particularly Ford and GM, but not only they) shot themselves in the foot for many years by not wanting to copy Chrysler. Ford and GM responded fairly quickly, but their initial efforts were the truck-based Aerostar and Astro/Safari. They had greater hauling and towing capacity than the Chrysler minivans, but they were not car-like, and they ended up appealing mostly to commercial customers. Other competitors also tried to do their own thing — the RWD Mazda MPV, the mid-engined Toyota Previa, and Honda’s original Odyssey, which was a terrible marketing blunder (basically a tall Accord wagon with conventional doors, rather than sliders, available only with a four-cylinder engine). When GM finally tried to do a FWD van, it was the bizarre “Dustbuster” Lumina APV/Trans Sport/Silhouette series, which they further handicapped by making available only with a 120-hp engine and a 3-speed automatic! Even the Ford Windstar (which took the surprisingly obvious idea of making a minivan on the Taurus platform) seemed unfinished. So, Chrysler benefited from around 15 years of colossal ineptitude on the part of its competition. It wasn’t until Honda and Toyota finally got it together with the big Odyssey and Sienna that there was actually a real threat, and in the past two or three years, Honda and Toyota have surpassed Chrysler in both sales and design (the current Chrysler vans are a weak effort). It was just as well that Chrysler had such a lengthy head start, because, depending on who you ask, they never got all the bugs ironed out. More to the point, they fixed some bugs and introduced others, the disastrous Ultradrive automatic being a leading contender. A lot of people feel that the Chrysler vans were brilliantly designed, but shoddily built, a seemingly eternal Chrysler problem. Yeah, those GM vans were totally off the mark. Sleek appearance, but the consequence was that extended dashboard and those goofy side windows. At least they only lasted a few years…then GM came out with more “normal” offerings. I agree with you that Chrysler got left behind. I don’t know if that’s because their former parent (Daimler-Benz) chose not to update things, or because Chrysler simply got complacent. Either way, they’re now in the position of playing catch-up. Unfortunate, since they were once the leader. I wonder if Iacocca set the precedent for now common superstar CEO salaries while rank and file employees muddle along losing ground to inflation.